Mezcal is the rustic cousin of tequila. Tequila can only be made from the blue agave plant, whereas mezcal is made from one of the other 150 species of agave native to Mexico. 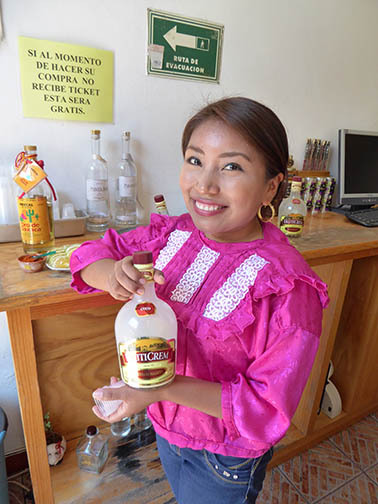 When visiting the Mexican state of Oaxaca, one will find mezcal for sale just about everywhere. Free tasting stands are located all throughout town, and besides the regular bars, restaurants and cafes, you will also find mezcalerias. Mezcalerias allow you to purchase copas of various brands of mezcal to see which ones you prefer. There are styles of mezcal made to please any palate. 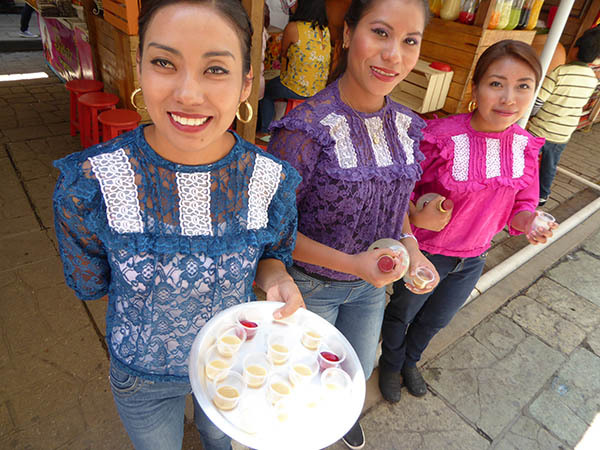 Here you see these women offering samples of a "cream" mezcal in flavors such as pina colada, cafe, nut, strawberry, coconut, jamaica, mocha and more. 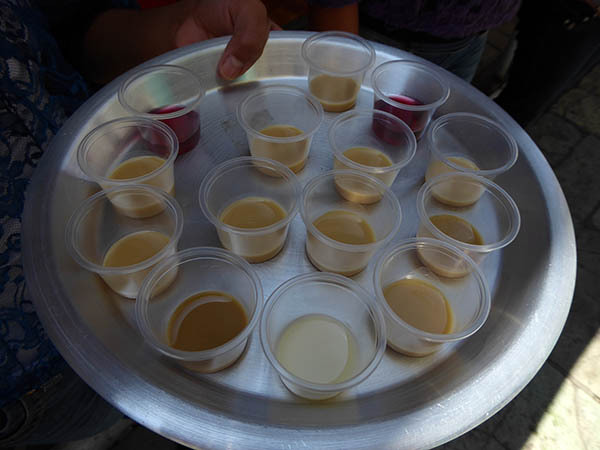 These cream mezcals are a favorite of tourists who come to the city of Oaxaca. They are sweet, easy to sip and are in flavors of different fruits, nuts and cafes. Here you can easily see the different colors and flavors of the free offerings of mezcal available. These would be considered dessert mezcals, not what a serious connoisseur would necessarily enjoy. 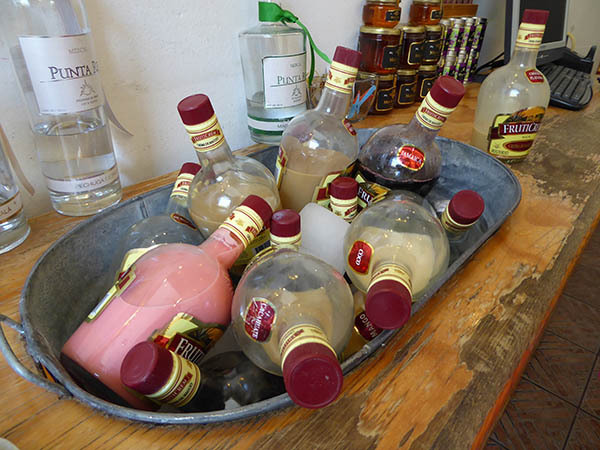 Obviously, the favorite flavors of mezcals for tourists are the creamy styled flavors. If you look on the table at the left of the photo, you will see a bottle of the clear, smoky mezcal for which Oaxaca is also famous. All mezcal gets its distinctive flavor during the production process. The pinas, or hearts of the agave plants are cooked in pits in the ground in the same way as one would do a pig roast. The pina is then crushed, combined with water and allowed to ferment. The identifiable characteristic of mezcal is still discernable through the flavorings of these "Fruticrem" products. Even though in samplings they are given to you cooled by ice, they are excellent poured over a glass of ice and sipped. 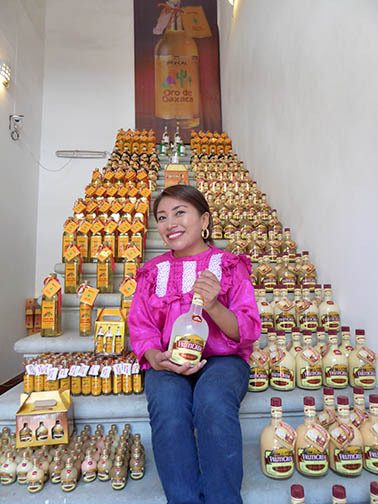 Stacked on the stairs on the left side in this photo is a local brand of Oaxaca mezcal, Oro de Oaxaca. 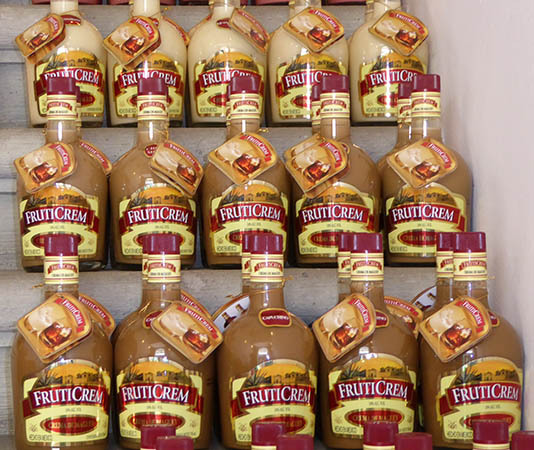 On the right side is a mountain of the creams. In the past, mezcal used to be called mezcal wine. So just as there are names of wines after the grapes that make them like Pinot Noir, Merlot, Sauvignon Blanc, in mezcal you have Madrecuixe, Tobala, Espadin, Largo, Cirial, Tripon, Barril - some 150 names! Most of the individual farmers have small operations for production. Unlike grapes which are harvested each year, sometimes farmers have to wait decades for their agave plants to mature. Large operations have fields and fields of agave at different ages so that their distilling process is not brought to a halt. The bottle should say whether it was distilled in a clay or copper pot . Clay pots produce earthier mezcals, while copper makes for a smoother taste. Mezcal is considered to be a craft spirit. You "kiss" mezcal, meaning you sip it, you don't shoot it down in a glass. Just as with fine tequila there is great respect for this beverage. 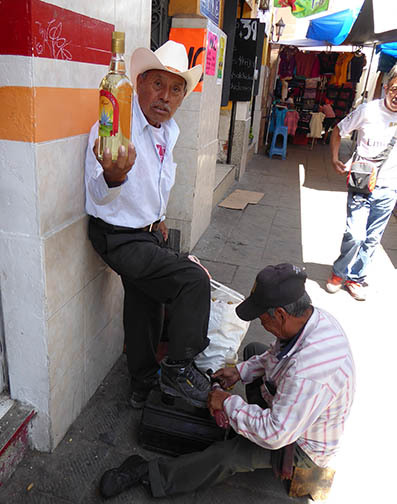 Prices range from $10USD for a bottle to upwards of $100USD. Served at room temperature in a wine glass to be able to enjoy the nose of the mezcal, it generally comes with a slice of orange, and a pinch of salt.